It is a controller in the form of a realistic assault rifle that helps you take your gaming experience to the next level. 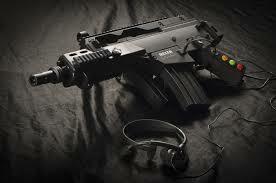 It is designed to help you move and act with the help of this assault rifle game controller (http://www.thedeltasix.com). While the controller might take some getting used to, you can probably correlate this to the Wii controllers in the past. I remember how awesome the first gun controller I had was. It was for the Nintendo 64 and it provided a whole new dimension to gaming with our friends! Well this revolutionary rifle takes it to the next level. It is superbly designed and looks simply stunning. In fact it looks a lot better than a real gun! You can see that it is designed for high end users when you first look at it. It comes with its own case with all the parts for assembly, much like a sniper rifle would. What really stands out is the fact that the project was backed by about 1000 supporters who covered its production (they raised the funds in under 30 days!). As you can see, this controller has a bright future ahead and an audience to boot! It was funded by the fans who want it, so how could it not? This entry was posted in Games and tagged Kickstarter, Nintendo, Personal computer, Playstation 3, Rifle, Wii, Wii U, Xbox 360. Bookmark the permalink.